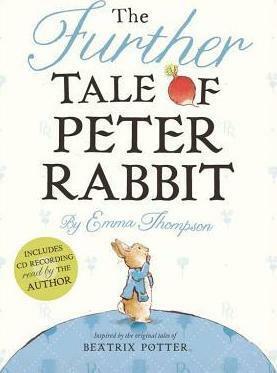 Emma Thompson celebrates 110 years of Peter Rabbit by giving us a brand-new tale! Celebrate 110 years of Peter Rabbit with a new, original tale written by Oscar-winning actress and screenwriter Emma Thompson and based on the original tales by Beatrix Potter. In this story, Peter's adventures take him beyond the boundaries of Mr. McGregor's garden and all the way to Scotland! With 72 pages of beautiful text and illustrations, this hardcover picture book, which includes an audio CD of the story narrated by the author, is sure to become a classic--and a collector's item! Emma Thompson is an Oscar-winning screenwriter and actress who lives in London and Argyll. Her father was Eric Thompson, the man behind The Magic Roundabout, and she remembers him reading Beatrix Potter's tales to her and her sister in his best Dougal voice. "We would always want The Tale of Mr. Tod, which is lengthy and satisfyingly spooky. He would always read The Tale of a Fierce Bad Rabbit, which has about three words on each page. But--thanks to Potter's genius--we were never, ever disappointed." Eleanor Taylor grew up in Scotland and England, and has a great affinity for the countryside of both places, which is beautifully reflected in the engaging characters and beautiful scenes illustrated in this book.